Blasteroid is a Bakugan Battle Gear and the tail piece for Dragonoid Colossus. Blasteroid is the mechanical tail of Dragonoid Colossus. 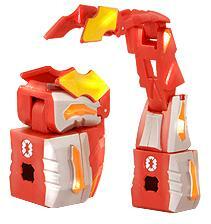 It is a mechanical Bakugan Battle Gear that swipes at enemies with great speed and force. In its Copper version, it has 50 Gs. Purchase your Blasteroid Battle Gear from Amazon now!